I built The 5-Day Teacher Challenge on a simple idea: getting better as a teacher can happen quickly and be fun, particularly if you are exploring the possibility with colleagues! Please join the 5-Day Teacher Challenge mailing list! 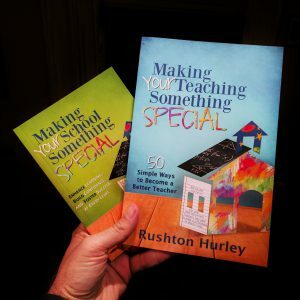 If you like the ideas you find in the Challenge, I’d love for you to take a look at the 50 suggestions I made in my book from EdTechTeam Press, Making Your Teaching Something Special. Each chapter is short (2-3 pages). The ideas are broken into the five areas above, and among the chapters you’ll find what’s in each day’s challenge, but in more detail. There are yet more ideas for making your campus and community a personally and professionally rewarding place for all in Making Your School Something Special. A portion of what I earn from the sales of these books goes to support the educational charity I run, Next Vista for Learning. You’ll find plenty of great books at the EdTechTeam Press page; please take a moment to see what they offer. Thank you for giving this a look, and for being the kind of teacher always working to reach the next child!